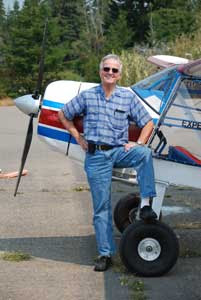 Senior Editor Bob Fritz is the author of the popular “The Home Machinist” series in KITPLANES along with numerous articles on a variety of subjects. 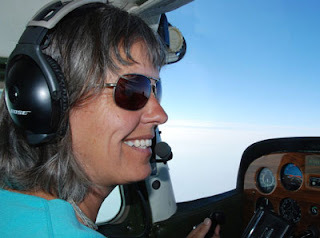 He completed a Jabiru J250 kit aircraft and wrote a series about building it. It's Thursday at AirVenture and the weather is great so, with feet worn out through hiking the booths and flight lines, I took the bus out to the seaplane base. Out of the way, yes, but well worth the ride. Wandering around I spotted a very small aircraft that had drawn a few folks and just listened in for a while. 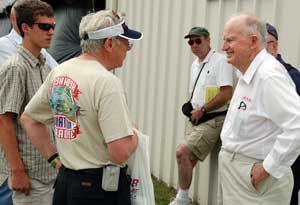 If airplane people are drawn together by a common interest, seaplane folks are more so, and in no time I was sitting at John Knapp's motorhome, cool drink in hand while he explained his plansbuilt Mini-Mong. 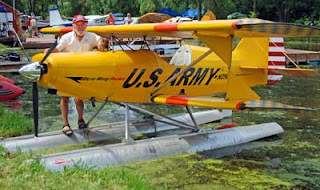 Now, with John standing on the float you can see that it's a small airplane. But when you calibrate to John's 5-foot-2 height you appreciate this little wonder a bit more. John built it from plans in a mere 700 hours with its Rotax engine. "I suspended it from bungee cords to figure out the float position, and when it looked about right I called it good," he joked. A bit more went into it, but he's built several other seaplanes, so it wasn't quite the the shoot-from-the-hip it would seem. Size, though unusual, is trumped by the addition of a centrifugal clutch on the prop. Normally, a seaplane starts moving when the engine is started. With John's airplane the engine runs, but nothing else moves. Hit the gas for taxi speed and the prop comes into play. He jokes that he's tempted to ask the unwary to "prop it" sometime just for the laugh. If you visit the Seaplane base, be aware you may be approached by a little guy with a big smile. I was walking among the thousands of airplanes at Oshkosh this week and noticed a subtle, but significant transformation; that square tip on the end of the prop of yore is giving way to a more scimitar looking device. Where a few years ago there were a few to be seen, now they are the dominant form on LSAs, especially those from Europe. What had been 4 inches inches wide and square on the end is now 1.5 inches and rounded. The air has not changed; horsepower is horsepower. So why the transformation? The answer to this was offered in a seminar on the subject of propeller design hosted by Jack Norris, who knows of what he speaks when it comes to the subject as his book explains in lay-terms. In a nut, all this knowledge is being rediscovered. Yes, rediscovered. Look at, for instance, the prop used by Glenn Curtis on the last of his seaplane racers--its look is suspiciously similar to these "new" designs. Why this knowledge was lost and then found again will be the subject of further discussion in KITPLANES. There are some amazingly simple things you can do to your airplane, and you can modify your flying technique to significantly stretch that increasingly expensive gallon of gas. Hint: fly with the throttle wide-open until... More on that later. George Mendonca has been flying for more than 51 years and has just made a personal goal: fly left-seat into all 68 non-privately owned airports within 100 n.m. of his home base in Hayward, California. That took more than you might think, though. Among the airports are SFO (Class B), Oakland and San Jose (Class C) and several military fields. The only way to accomplish this was to start out flying KC-135s for the USAF, then switch to Boeing 737s with United and finally his own Kitfox 4, which you might recognize from KITPLANES Completions. Mendonca logged more than 22,000 hours of flying in his career and still has the enthusiasm to average about 80 hours per year in his Kitfox. He did get a bit of kidding, though, because almost half of that 100 n.m. circle is over the ocean. Perhaps he’ll try for an aircraft carrier? We recently tried out a set of VedaloHD sunglasses and are quite impressed with them. They're made in Italy and have the look of sophisticated style that one expects of Italian products. More importantly, they function as well as they look. Rather than depend on polarizing or bizarre lens colors, VedaloHD has embedded a proprietary material right into the lens. The effect is to boost the red end of the visible range, reducing the effect of haze. Chris Pederson, the marketing director, says the drawback is that they've been unable to offer a prescription version. From what we've seen (pun intended), that's not a problem for most folks in that VedaloHD offers a clip-on for regular eyewear. They're offered with titanium wire frames that are hinged so that annoying springy-ness is avoided when they're being put away. The standard frames stood out a bit too far for one of the testers and allowed noise in past the headset cushions. The other tester, with not so narrow a face, had no problem. While a bit pricey at $165, they're hard to beat for comfort and function. For more information, visit VedaloHD. 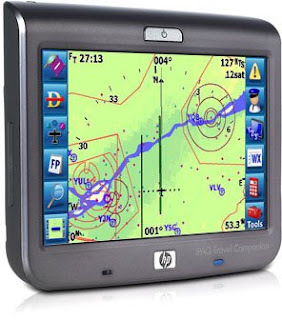 Anywhere Map made quite a splash in the pond of low-cost GPS devices when the company introduced its PDA-based systems in 1999. Early users were attracted to the ability to upgrade the software through their computer, and even get the latest TFRs just before a flight. The separation of the hardware from the software also meant that as the hardware got better, the user could keep it up to date as well. Anywhere Map has addressed this with the release of its Anywhere Travel Companion, cleverly named ATC. It does its downloading without going through ActiveSync by shifting from trying to be all things to all people to being a GPS only. The product's genesis was as a PDA with GPS added, which meant it needed to use the PDA interface. Now that many of the PDA functions are on your cell phone, PDAs are passé. However, the small screen size of the phone works against it being employed as a GPS. AWM’s approach was to see that divergence and offer a much larger 4.3-inch screen without the problems of ActiveSync. Early users will also appreciate that this is a touchscreen device as before, but the larger screen means larger buttons and no more using a stylus. This new dessert is topped with a street database, so you still have a multifunction device. We’ll be doing a review in KITPLANES, but for now visit Anywhere Map for further details. The extensive smoke from the fires in northern California had dissipated enough to make the annual airshow at the Lake Tahoe Airport (KTVL) worth going to. Normally a small event, the smoke did not inhibit the performers or intimidate drive-to attendance. It did, however, have the effect of making the ramp area look more like a military airshow than a civilian event; fly-in attendance was sparse. With an elevation of 6264 feet, KTVL’s 8544-foot runway length is needed. The effect of altitude was apparent in an unanticipated way. Prudence dictated that the airshow performers add about 1000 feet to the altitude used for their routine, and it was visually apparent why. Pull-out at the bottom of a loop sometimes showed a very high angle of attack from which the pilot immediately recovered. Without the extra altitude it might have been more than a curiosity to the sharp-eyed. Even with the low turnout, some interesting aircraft were on display. 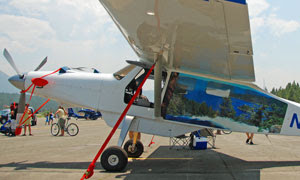 Cessna was evident in a beautiful, all-glass aircraft with a prominent Cessna logo. Another head-turner was a CompAir 7 with a turbine engine that used the flat sides of the fuselage for photos of the region. 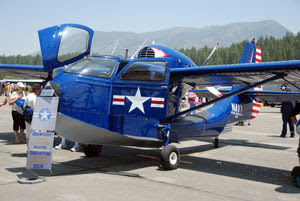 The favorite of the show was the SeaBee with a Corvette engine. A winner at multiple airshows, it had a constant crowd admiring the detailing. In 2009, hopefully, the show will not be inhibited by smoke. Even this year, though, it was still worth the outing.